Meticulously detailed to evoke the early 1970s and Cold War espionage, Tinker Tailor Soldier Spy creates plenty of atmosphere and “trust no one” tension, but it lacks a sense of urgency and a central figure to trust – or care about. Tinker Tailor Soldier Spy is the opening salvo in John le Carré’s Karla trilogy (followed by The Honourable Schoolboy and Smiley’s People). Le Carré co-produced this movie version but left the screenwriting to Peter Straughan (The Debt) and Bridget O’Connor (Sixty Six). It’s all about a mole in the topmost levels of the Circus, the codename for the British government’s Secret Intelligence Service, better known as Military Intelligence Section 6 or, simply, MI6, located in London’s Cambridge Circus. The mole was planted by Russians in the heat of the Cold War. Tensions rise after a botched assassination attempt in Budapest; after that, the intended target, Jim Prideaux (Mark Strong, Sherlock Holmes), is moved into an incognito existence as a school teacher living in a trailer. Any one of the half-dozen or so top agents that meet in the close confines of the MI6 chamber of secrets could be the mole. At any given time, each one of them is worthy of suspicion even as they are all entrusted with the nation’s top secrets. 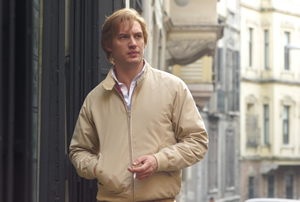 The spy world of Tinker Tailor Soldier Spy is all about thinking and analysis. While it’s not a dry procedural story, it’s also not the world of James Bond or Mission: Impossible. There’s no Ernst Blofeld or Auric Goldfinger. There’s no Oddjob. There are no ignited fuses or self-imploding recording devices. 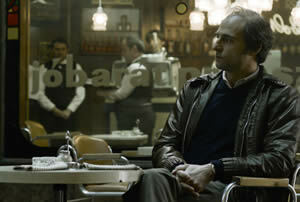 The film’s score, by Alberto Iglesias (The Skin I Live In), follows suit, skipping the brassy wah-wah horns and orchestrations of typical Hollywood spy fare for more subtle tones. This is the world of character analysis via conversation and putting all the puzzle pieces of people and places together to determine for whom the mole tolls. In place of action, the cinematography by Hoyte Van Hoytema (The Fighter) effectively captures the atmosphere of pungent, clammy rooms reeking of smoke; the furniture and clothes have all got to smell like something ungodly. Anybody who’s been in a chain smoker’s hotel room, hermetically sealed without any option to open the windows, with the smoke left lingering in the room for all eternity and absorbed into the very fibers of the sheets, pillows, towels, and walls, can appreciate the suffocating air conveyed on screen. It’d be a terrific piece of trivia to get a count of the number of cigarettes consumed during this movie (and, more broadly, by the production on- and off-screen). It’s striking how the past few years of hyper-sensitive, white-washed lifestyles in the movies have made scenes of cigarette smoking less and less prevalent. 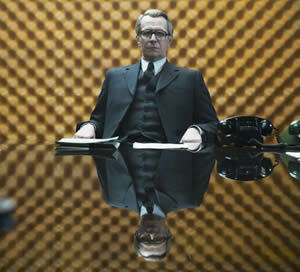 Thank goodness Tinker Tailor Soldier Spy makes up for all that lost time – and ashes. Also making the movie an engrossing, but oddly unmoving experience is a first-rate, albeit male-heavy, cast. Leading the circus in the Circus is George Smiley (Gary Oldman in a role previously occupied by Alec Guinness, Denholm Elliott, and James Mason, among others). Buzz about Oldman finally getting some Oscar love has been on the rise while this movie stealthily makes its way into more and more theatres across the United States, having launched in England back in September. Oldman is indeed a great, great actor who’s done some terrific stuff, including the title role in Bram Stoker’s Dracula and Sid Vicious in Sid & Nancy. But Tinker Tailor Soldier Spy isn’t the movie for Oldman’s Oscar gold; Oldman has delivered more meat in his performances as the disheveled, downtrodden Commissioner Gordon in Christopher Nolan’s Batman movies. Much of the effectiveness of Oldman’s performance here is a byproduct of the movie’s atmospherics – reflected light filling the lenses of his eyeglasses, frame composition and camera positioning affording more candid appearances. An Oscar for this would be akin to the appalling Oscar win for Tommy Lee Jones in The Fugitive; a fine film and a fine enough performance, although it was virtually identical to almost every other character Jones has ever played. That was at the expense of much higher-caliber material in Ralph Fiennes’ performance as Amon Goeth in Schindler’s List. Oldman’s fine here, but there’s nothing surprising in his performance. Smiley is a pretty quiet guy who spends most of his time thinking, but with a couple scenes of extended exposition and modestly meaningful monologuing. The eye-catching supporting performances belong to Mark Strong and Tom Hardy (Warrior). Both show new facets and a broadened range in the thick of already impressive careers. And, while on the Oscar ramble, there’s also Colin Firth, a well-deserved Oscar winner for his take on King George VI in The King’s Speech. He fits in perfectly with his fellow seasoned cast mates, John Hurt (Alien) and Benedict Cumberbatch (War Horse) also among them. Swedish director Tomas Alfredson, who created quite a sensation with Let the Right One In, a vampire movie (with heart) remade as Let Me In for more American sensibilities by Matt Reeves, has the gift for fine atmospherics akin to David Fincher and he knows how to draw out great performances from the young stars of Let the Right One In to the veterans of Tinker. But the fine performances and immaculate creation of a sense of time and place aren’t quite enough to move this movie into the year’s upper crust. Amid all those marvelous details of 1970s furnishings and technology – dual-reel tape machines, wired phones, stacks of documents – there’s a nagging sense that people were smarter back in the ’70s (unhealthy, self-destructive habits notwithstanding). Technology makes life easier, most definitely. But a side effect of that easier life is a softer society. The men working through the spy rings of Tinker Tailor Soldier Spy had to think on their feet, be in the thick of situations, and work within severe technical constraints. Given the smart factor of the onscreen characters, the movie inadvertently shows a smidge of modern softness. With characters traveling the globe and dealing with intense situations in London, Paris, Budapest, and Istanbul, the diversity of languages is nicely captured. But then, in an unnecessary nod to slavish detail, when the subtitles appear, they are prefaced with the language being spoken (In Hungarian), (In Russian), and the like. It’s an annoying clue for those who most likely wouldn’t know what to do with that bit of information anyway.